I used to think of poetry as something rich people did. A perk of affluence. Poetry is for those with free time. Academics and others who never need to worry about efficiency. But I was wrong. Poetry is human. You cannot, and will not, live without it. Poetry is not something that you add on to your life. People are poetic. We exist with poetry all around us. We measure gigabites in our pocket by how many poems we can carry in. 8gb is virtual space for 1750 songs, 16gb holds 3500, while 32gb will keep 7000 poems at your immediate disposal to pipe through little white buds. Besides that, think about the gum you chew. If you choose right, you can Kiss a little longer/ stay close a little longer/ hold tight a little longer/ longer with Big Red!// That Big Red freshness lasts right through it/ your fresh breath goes on and on/ while you chew it! Language is musical. Language dances and warbles and whistles. You cannot avoid the poetry. You will take it in. It is not a question of if. It is only a question of what kind of poetry will fill your soul. Will your humanity be filled out with good poetry? Or will you live your life on thin poetry. Will you feed your soul on the diet pills of pop poetry trying to buy and sell you until it is like a supermodel: thin, chesty, and grouchy because she is hungry. Every one of us has countless poems memorized. Whether we are just a small town girl, livin' in a lonely world or a father, who had a son, whose life is slip sliding' away, poetry is all around you. 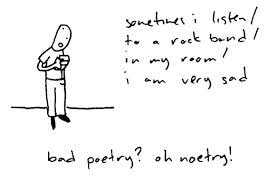 You might never read a poem on purpose, but does that mean you live a life without poetry? Gimme' a break. Gimme' a break. Break me off a piece of that Kit Kat bar, and realize that poetry fills the air wherever humans fill the ground. We live out of the image of the God that made us, and he is a poetic God. When we are first said to be made in the image of God (Gen. 1:26-27), the only thing that we know about him so far is that he speaks, and the world is. God is a speaking God. His words have power. We are said to be made in that image. God is a preacher, a story teller, a conversationalist, a lyricist, a poet, and so we, as his image, are the same. Even when we turn against God, we rail against him the way his image would. We yell, and talk dirty, and manipulate words, and lie, and yell our lyrics to the other gods. But we are children of the poet, and until the second death, we will be poet-people. So you may as well just give in. Embrace poetry. Find a guide to take you through the battlefields of the history of poetry. Perhaps Sir Arthur Quiller-Couch's 'Oxford Book of English Verse'? Or William Harmon's 'Top 500 Poems'? Then start marching. It is a trek. It is work. But you were built to be moved by poetry. You have a poetic inheritance, buried in the basement of your ancestral home. All you have to do is start hauling it up into the front yard where you can sort it and dust it and enjoy it.